My son’s school is closed today because of a flu outbreak, so we are sitting home snuggled up in PJs watching cartoons and praying that none of us catch it. Thankfully we are well so far, and hope to stay that way. With the way things are going, though, who knows. The local hospitals are all at capacity and the governor has declared a medical state of emergency because so many people have the flu. Since the hospitals cannot handle the heavy influx of sick people they are advising folks who are not in a dire emergency to stay home and treat their flu symptoms with “home care”. But, what does that mean, exactly? We all know about the OTC products that cover the pharmacy shelves, but is there more you can be doing? I am not a healthcare professional, but I am an experienced mom who tries to provide safe, effective and all-natural remedies when my little ones are sick. 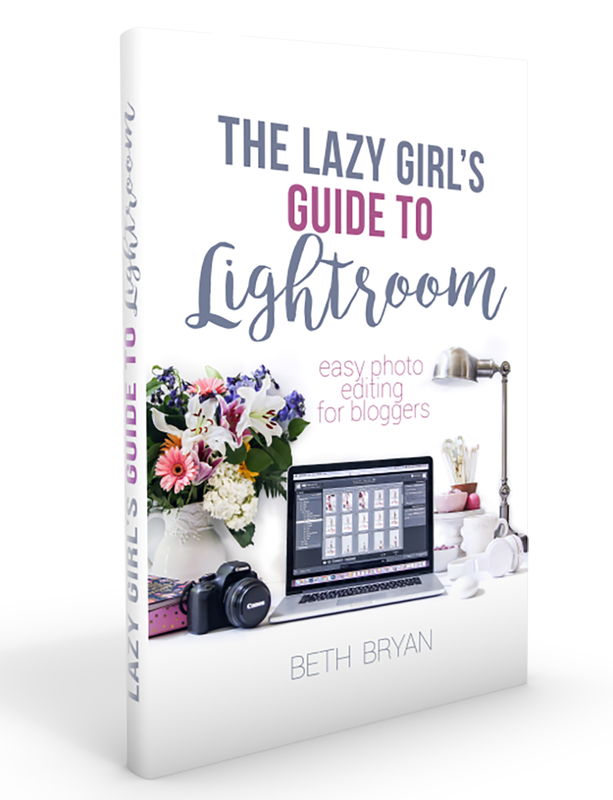 I hope this information will help someone in some way. If you are looking for some all-natural ways to fight the flu at home, here are some strategies to consider. Boost the Immune System, like…now. Before the flu ever comes knocking, it’s important to start boosting your immune systems so it can fight for you. You need to have a winter wellness game plan in place well before flu season begins to help prevent it from coming to your family. I am a Young Living lover so we have been oiling up with essential oils and diffusing Thieves essential oil to boost our immune systems. The kids each have a roller ball premixed with half Thieves and half carrier oil so we can easily roll Thieves on our feet a couple of times a day. I am also diffusing it in several locations around the house. My motto is an ounce of prevention is worth a pound of cure. 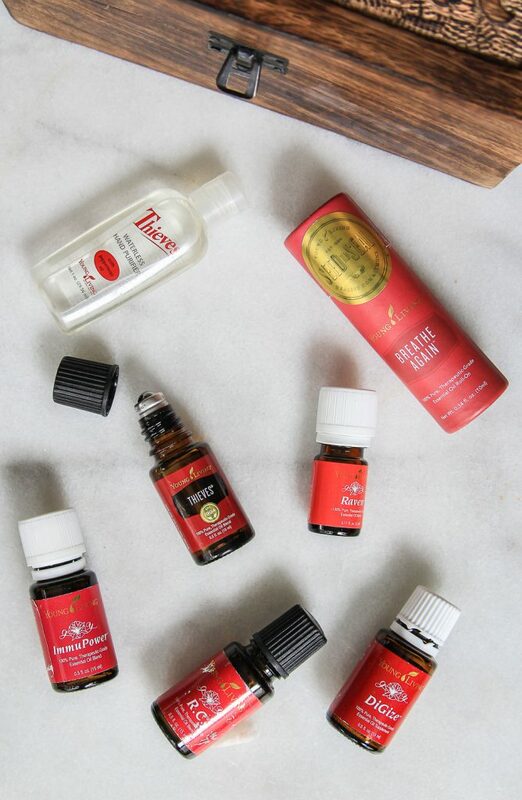 Here are a few more essential oils that I always keep on hand during times like these. Click here to purchase any of these essential oils. Please use my member # 1516864 at checkout, and let me know if you’re interested in more info about becoming a YL member to get the discount. While we are on this topic- Please don’t buy cheap essential oils from Amazon or Walmart. If you’re going to use them, be sure to use a brand name oil that is therapeutic grade and not adulterated with harmful chemicals. This is why I have used Young Living oils for nearly five years in my home. I trust them. They are safe as long as you know how to use them. Do your research. I am also taking Inner Defense and Super C to boost my immune system, but they are the size of horse pills so the kids definitely won’t swallow them. The kids are drinking Ningxia Red and kefir smoothies along with probiotics to try to bulk up their good gut bacteria as much as possible. They both love these smoothies so this is more of a treat than anything else. Besides essential oils, I also have elderberry syrup and herbal teas on hand. You can google elderberry to read about the history of this medicinal plant that’s been used for millennia to fight colds and flu at home. I also have a product called Flew Away, which is an elixir from Mountain Rose Herbs that has elderberry, echinacea and astragulus root powder. 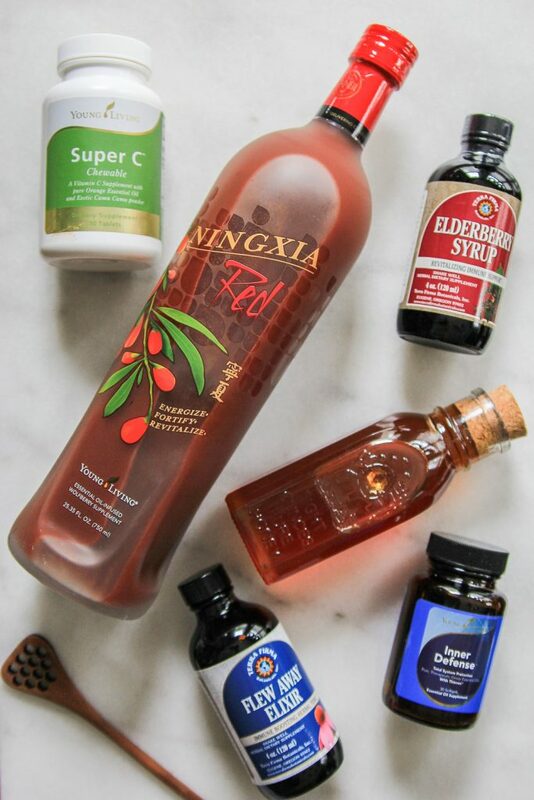 Unfortunately it’s hard to find these days so you might look for elderberry syrup or gummies as a good alternative. This one is probably the MOST important rule of all. Currently the US is suffering from a massive shortage of IV fluid bags because several manufacturing plants got knocked out during the hurricane in Puerto Rico and they are still without power four months later. This is a crisis because IV fluids are the first thing they would give you if you went to the hospital and the US has a critical shortage right now. So, drink, drink and drink. Clear liquids are best. 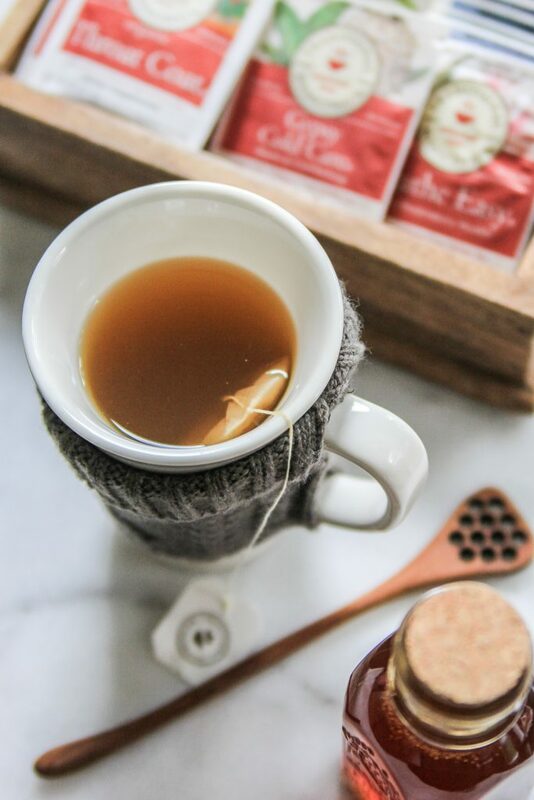 My favorite teas for times like these are Traditional Medicinals Seasonal Sampler, which comes with Throat Coat, Breathe Easy, Gypsy Cold Care and Echinacea Plus. Add a little bit of local honey to help soothe a sore throat. Hot herbal tea is an excellent way to get clear liquids to help break up cough and nasal congestion. Sip on it as much as you can throughout the day along with plenty of water. Avoid all soft drinks, especially ones with lots of sugar and caffeine. These will dehydrate you even further. It’s a good idea to avoid sugar all together to let your body heal without further inflammation. If you have a little one who won’t drink much- consider popsicles instead. They feel good on sore throats. Be sure to get the all-fruit kind so they are getting something besides sugar and red food dye. Another excellent way to stay hydrated while getting super nutrients is with a homemade broth. I make this pretty often at my house by stewing a whole (organic) chicken in the crockpot for a few hours. 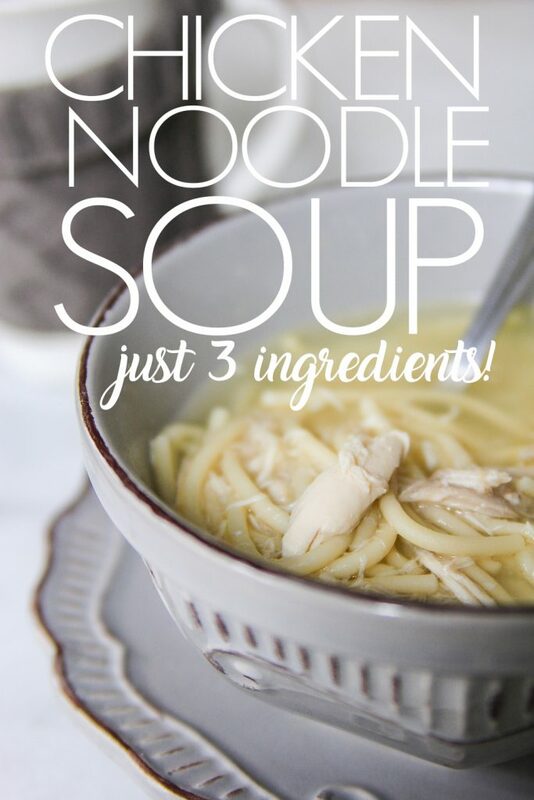 Here is my recipe for homemade chicken noodle soup which is SO quick and easy and delicious. Plenty of folks like to make fun of me for making my own chicken soup when you can buy canned soup, but if you ever read the label on the back of a can of soup you’ll see why I do it. My soup literally has four ingredients–Chicken, noodles, salt and water. And I can control the salt content. It’s really very easy to make yourself, and it tastes SO much better. There is science behind why chicken soup is recommended to colds and flu recovery, but I’m not sure if it counts if you use the canned junk. Homemade chicken broth is like liquid gold, so that’s why I go that route. Steamy showers, humidifiers with menthol, essential oil diffusers (which are different than humidifiers) with peppermint and eucalyptus are all good ways to keep the congestion moving. You’ll also want to open the windows and air out the sick room (if it’s not too cold outside) as much as possible. Take a hot bath with epsom salt and a few drops of menthol. Epsom salt is cheap, and doctors say soaking in it might help ease the body aches as it fights the symptoms of a cold or flu. It might also have a detox effect to help clear the bad stuff out of your system faster. I also really love the J.R.Watkins menthol bath soak and mentholated cough suppressant rub. You can usually find Watkins products at your local Walmart, Target and even Cracker Barrel if you’re looking for some locally. Soak in the epsom salt bath and then rub the menthol salve all over chest, back and bottoms of the feet. Then put on some nice warm socks and crawl into bed. I know it’s gross, but you do NOT want congestion to sit in your chest. It needs to come out so that it doesn’t turn into pneumonia. Pneumonia is extremely life-threatening so take this part seriously. Keep a big box of Kleenex by your bed along with a trash can and toss your tissues as soon as you use them. A Neti pot can also help with sinus relief. Lots of folks swear by them for allergies and sinus issues. Your body needs rest in order to fight the germs. Try to sleep as much as possible to give yourself time to heal. Of course we also have OTC medicines like cough syrup, Tylenol and Ibuprofen and I would definitely use it round the clock if we needed it to bring down fevers. Other than that, plenty of rest and fluids is the name of the game when you are trying to take care of the flu at home. Wash your hands constantly and cover your coughs as much as possible. Quarantine the sick folks and have just one caregiver if that’s possible. Try your best to contain it so it doesn’t spread to everyone in the house. Most importantly- if you are sick, STAY HOME. Do not get out and spread your germs to more people. The flu is no joke, so don’t put others in unnecessary danger by going out in public with it. There are many folks out in the world who have very weak immune systems and the flu can be deadly for many people. Take this seriously for everyone’s sake. Here is a link with more great info from the CDC on how to prepare your household to care for someone sick at home with the flu. Even though most of this is common sense stuff, the information contained on this website is not meant to diagnose, treat, cure, or prevent any disease. The information represents what I, an Independent Distributor of Young Living Essential Oils, have chosen to do to take charge of my own personal health and that of my family. Statements on this website have not been evaluated by the Food and Drug Administration. Products on this site are not intended to diagnose, treat, cure or prevent any disease. If you are pregnant, nursing, taking medication, or have a medical condition, consult your physician before using these products.